Cut meat and mix ingredients for marinade. Cover and put meat in the refrigerate and let marinate for 24 hours. Cover oven rack with foil and place the meat across racks. Set oven 160 – 180 degrees. After the meat has stopped dripping, turn each piece over. Cook for about 4-6 hours depend on what you like and remember to leave the oven door slightly open for ventilation. Enjoy! This recipe is awesome go on the low side for the cayenne pepper if you or your wife does not like it a little spicy. I freeze the meat then use a meat slicer before marinading. I also use a dehydrator to cook the meat, just be sure it has a fan or you will be waiting forever. Made it, liked it. It was yummmmmmy. I have made at least 7 batches of a min. of 3 lbs each and it is awesome. Taking some (a huge bag) to a class reunion in Indiana next month. I am surprised this was the first and only one I have yet tried! Hey, don’t fix it if it ain’t broke! Can this recipe be used with ground meat? If so how would you do so? This recipe was great! I used ground turkey, and it turned out great. Very characteristic jerky taste. @Susan-to use ground meat, ground meat can be used, and it’s easiest to use in a meat gun. It’s important to remember that ground meat takes less time than usual. I use the Nesco Harvest meat gun, and it works well. Are you saying I can use any “wet” recipe for ground beef? I am using the Nesco dehydrator and love it but have only been using their spice packs. I want to use a recipe but it seems most are geared towards sliced meat. Sorry for the super late response, but I use the “wet” recipes for any kind of ground meat. I do try to strain it a little bit as I put it into the gun. If you use ground meat, does it need to marinate for 24 hours or use it as soon as it is mixed. I found this recipe several months ago and haven’t tried another since. I make about 5 lbs every other week, most of which I give away to others. 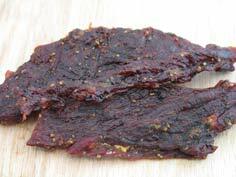 This is not only the best jerky I have eaten, it is what EVERYONE whom I’ve given some to also claim to be the best jerky they’ve ever had. I modify the recipe on occasion to add more heat, as I’m a fan of heat. I add cayenne hot pepper sauce (4 or so ounces) and Sriracha (roughly 4 ounces). After they are done I sprinkle a little red pepper flake on them. This adds the perfect amount of heat for me.